The reason computer security experts recommend against downloading freeware from third-party websites is that freeware often comes in packs, and it can result in the likes of Websearch.fastsearchings.info entering your system. The aforementioned domain refers to a browser hijacker that gets installed on a computer automatically, together with a list of freeware applications. It is not complicated to remove Websearch.fastsearchings.info from the system, but it may still present certain difficulties and system threats you should be wary of. What is more, you should get rid of all the other unwanted applications that have arrived with Websearch.fastsearchings.info. Websearch.fastsearchings.info is a browser hijacker that is based on justplug.it extension engine. Most of the time users are not informed about the oncoming browser modifications because this application gets installed automatically with the programs it comes bundled with. Based on our research, this hijacker usually arrives from third-party websites that distribute fake Java plug-in or Flash player updates. The thing is that it is not only Websearch.fastsearchings.info that travels around with these fake updates. There is an entire package of adware and potentially unwanted freeware that make use of the same distribution method, so you need to be extremely careful. The program that changes your default homepage and search engine can be called either MySearch or SearchNewTab. It depends on which version of the setup file enters your computer. In general, you can remove Websearch.fastsearchings.info files by uninstalling MySearch via Control Panel. Nevertheless, removing this application does not restore your web browser settings. Technically, Websearch.fastsearchings.info is not extremely malicious. It is a browser hijacker from a big group of Websearch infections, and it is practically a newer version of websearch.webisgreat.info, websearch.searchinweb.info, websearch.fastosearch.info and many other similar browser hijackers. They all look like decent search engines, but if you perform a web search via Websearch.fastsearchings.info, you will notice that all of your queries will be redirected to Google. 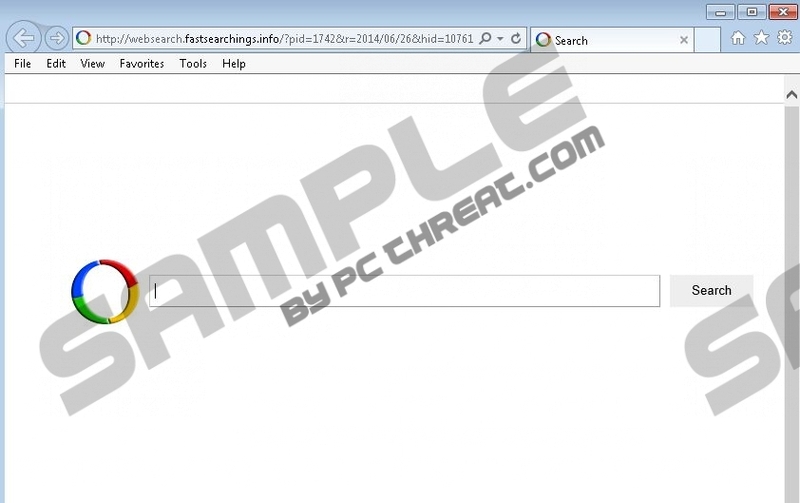 In other words, this browser hijacker makes use of a custom version of Google search engine. It is very likely that Websearch.fastsearchings.info tweaks some of the search results, inserting links to commercial websites. Monetary profit is the primary objective of Websearch.fastsearchings.info. Adware creators make use of such applications in order to promote commercial content. After all, most of the online marketing websites employ pay-per-click system, so by displaying third-party links and redirecting you to affiliate websites, Websearch.fastsearchings.info helps its creators to make money. Unfortunately, sometimes those links could be embedded with malicious content. That is why you should not trust Websearch.fastsearchings.info blindly. It goes without saying that keeping a browser hijacker on your computer is not an option. Get rid of Websearch.fastsearchings.info immediately and then scan your PC for other potential threats. Do not hesitate to invest in a legitimate antispyware tool if need be. Open Uninstall a program and remove SearchNewTab or MySearch. Select Uninstall a program and remove SearchNewTab or MySearch. Double-click Add or remove programs and uninstall SearchNewTab or MySearch. Click Use default button under General tab and click OK.
Press Alt+T again and go to Manage add-ons. Open Search providers tab on the left pane. Set a new default search engine and remove Websearch. Click Restore to Default button under General tab and click OK.
Press the search engine icon on the left of search box (top right corner). Remove Websearch from the list and click OK.
Click Set pages and enter a new homepage address. Click OK.
Set a new default search engine, delete Websearch and press Done. Quick & tested solution for Websearch.fastsearchings.info removal.